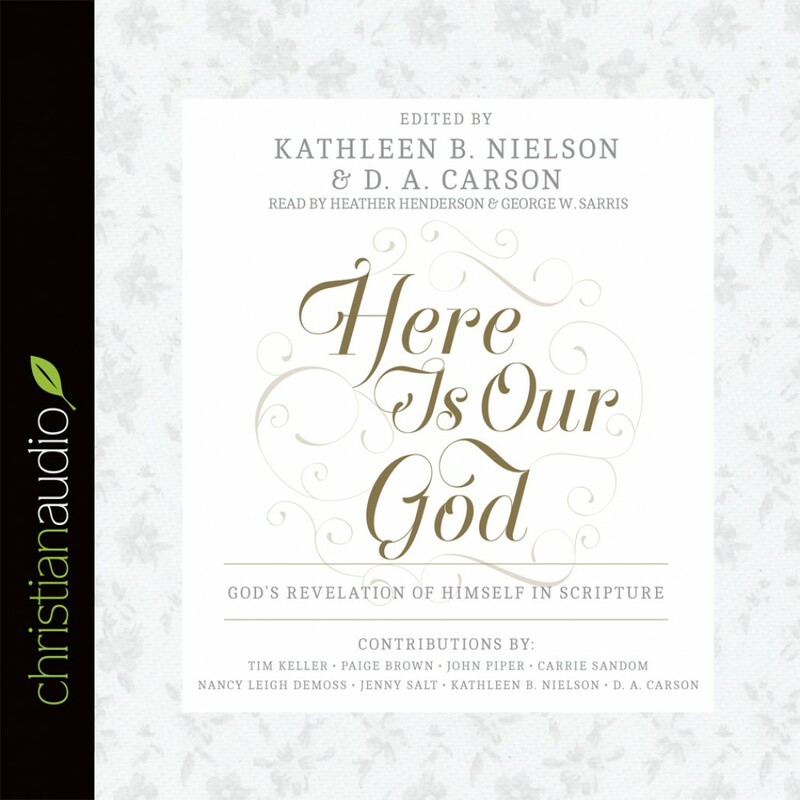 Here Is Our God by Kathleen B. Nielson and D. A. Carson is a collection of message preached at a women's conference a couple of years ago that examine several famous expressions of God's glory in the Bible. Each chapter focuses on a different account such as Moses and the burning bush and the transfiguration in the gospels. It is a thoroughly interesting, if albeit disjointed, collection of messages from a range of different preachers with different styles, which help to reveal the nature and glory of God through accounts in the Bible. I have read these passages many times before but some of the insights I got from this text were quite fascinating. The narrators were very good as it is a mixture of both male and female authors, so the corresponding male and female narrators do a great job at conveying the tone of the messages. They are very easy to listen to and easy to follow as well. The presentation of the nature of God outlined in this book would be great for both new and mature Christians alike as it covered the topic in such great detail while being simple to understand. This book is a collection of messages from The Gospel Coalition 2012 National Women’s Conference. Great speakers that we all know well such as John Piper, Tim Keller, and D.A Carson, contribute as well in delivering their message about the glory of our God. The book tackles the manifestation and glory of our God throughout the Bible (from the Old Testament to the New Testament): starting from God’s appearance through the burning bush to Moses to the end of days on the Book of Revelation. Each speaker gives an exposition to a particular passage that reveals a bit about our God’s revelation and tries to connect where the previous speaker has left off (from the previous series of passages). However, since these messages are compilations from different speakers, they feel a bit disjointed and there are minor repetitions about some of the points here and there. At the same time, however, it’s good to hear from a different perspective and style of each author. There are great expositions about the passages from some of the speakers and the audiobook is also narrated really well. At the end of each section, there are some reflection questions for you to ponder about. In many ways, you do have to try to find your own applications on the theology that you have just learned/listened to. It’s easy to get caught up on the knowledge that these expositions offer and simply listen to the next chapter if you are not careful. I received this book courtesy of Christian Audio for the purpose of writing a review. Narrator Thoughts - I thought that both of the narrators did a wonderful job of making the chapters come alive. I liked how it would alternate between the two of them. It added a nice freshness and depth to the narration. Besides both of them have very melodic voices. It made it a very enjoyable listen. Book Thoughts - I greatly admire and enjoying reading books from the authors that worked together to write this book. This work was beautifully put together and very refreshing. Each bringing their own thoughts and encouragement to the table was uplifting. So many of the chapters hit it home for me. The chapter on the Holy God was very good. How God is God. He is worthy of praise and worship. Yet he chose to reach out and love us. Through story and scripture the writers encourage you to live for God and dwell on Him. It's a wonderful listen for anyone. Here is our God is a collection of expositions by different authors on the biblical accounts of God visibly revealing himself to mankind. From the encounter with Moses at Sinai, to His glorious appearing to Isaiah in the temple, to the Transfiguration of Christ, each of these accounts is examined in detail and with practical application to the reader. However, what makes this book really unique is its origin. Each chapter is based on a different message given by the respective author at a women’s conference hosted by the Gospel Coalition. These talks were then edited into a more reader-friendly form by Kathleen Nielson and D.A. Carson, both of whom also contributed a talk/chapter to the book. Only three of the chapters are from male contributors: Carson, John Piper, and Tim Keller. This makes for a unique and refreshing perspective, as most works of theological exposition are historically to be written by men. It’s even stranger to a have a book like this come from the Gospel Coalition, as they tend to hold a complementarian view of women’s roles. I really appreciated the scope and focus of this book. All the authors are talented expositors and gifted communicators. It was fun and even inspiring to hear them all put their collective command of language to the task of describing the Indescribable. I particularly liked the chapter about Solomon’s dedication of the temple, and the manner in which God “dwells” with His people. Great stuff! I left this book with a greater appreciation for both the immensity of God, and the glorious riches of God’s grace. I’d say these authors would count that as a win, judging by their passion for the subject. If you feel like your vision of God needs some enlarging, this book is for you. Because this book represented both female and male voices, narration duties are split between Heather Henderson & George Sarris. Both narrators do a great job, and it was a brilliant decision to divide the book up between two distinct voices. "Here is Our God: God’s Revelation of Himself in Scripture" (Crossway, 2014), is the latest book from The Gospel Coalition. This book is actually a compilation of the messages from the women’s 2012 TGC conference. Reading the book, however, I am not transported to the scene of thousands of women meeting together in a conference. Instead the message of each plenary session is powerfully communicated in this book, and the entire theme of the conference—suitable for men and women—comes together in this one short volume. Three men (Tim Keller, D.A. Carson, and John Piper) join five women (Paige Brown, Carrie Sandom, Nancy Leigh DeMoss, Jenny Salt, and Kathleen Nielson) in expositing the Word of God. Each author tackles a text which offers us a revelation of God. Exodus 19, 1 Kings 8, Isaiah 6, Matthew 17, Revelation 21 and other passages are mined for what they tell us of our God. The chapters flow together well, and reinforce the argument of the work as a whole. Each author in their unique way contributes to a dazzling picture of our God and His glory. D.A. Carson (one of the editors of this book) is known for his advocacy of biblical theolgoy, and this is on full display in the contributions from each author in this title. The grand themes of the Bible are followed as we truly encounter God through the book. The application is poignant, and the messages are powerful. I’m glad that by means of this book I was able to be blessed by this women’s conference! I listened to the Christianaudio.com version (link is external) of the book. A male voice read the chapters written by men, and a female voice the other chapters. The editing in the book being as excellent as it was, allowed the audio version to flow well. Connections between chapters were made, and the reading speed aided in reflection. The book itself is extremely well written. You would be hard pressed to find a more God-centered example of biblical theology. I appreciated that the Old Testament received due attention. In fact both testaments are treated, and so many foundational texts are treated that this could be considered a miniature whole-Bible biblical theology in its own right. The conference aimed to make much of God and this book does that. If you are hungry for an encounter with the God of the Bible, this book will reveal Him in fresh and helpful ways. The call to holy living and a deeper faith permeates the book, and the Gospel of God’s grace underlies it as well. The book would serve well as a small group resource, with questions at the end of each chapter that could be used for discussion. I encourage both men and women to avail themselves of this helpful resource. May God bless you with a greater revelation of Himself in the reading of this short book. Disclaimer: This book was provided by Christianaudio.com. The reviewer was under no obligation to offer a positive review.